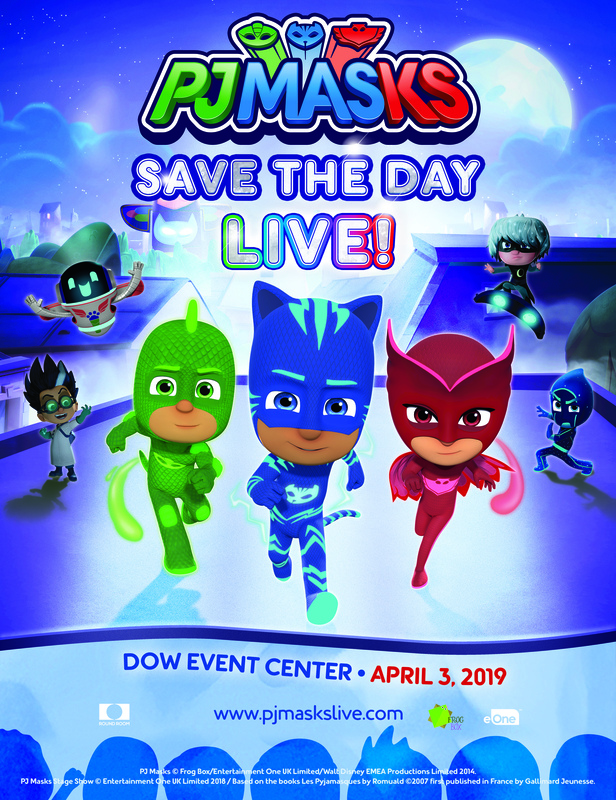 Wednesday, April 3, 2019 at 6:00 p.m. | Doors at 5:00 p.m.
PJ Masks Live! is back with an all new super-heroic, live musical show, featuring the heroic trio from your favorite series: The PJ MASKS! Watch Catboy, Owlette and Gekko along with their new friend, PJ Robot, as they try to save the day from the sneaky villains – Romeo, Night Ninja and Luna Girl! Fluttering Feathers! Leaping Lizards! What a CAT-tastrophe! Super Fan Presale: Wednesday, November 14, 2018 at 10:00 a.m. – Thursday, November 15, 2018 at 10:00 p.m. The Super Fan Presale is only available to members of the PJ Masks Live! email list. 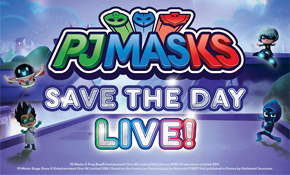 To sign up, please visit http://pjmaskslive.com/newsletter. The Super Fan Presale is available online only at Ticketmaster.com with the Super Fan Presale code. Venue Presale: Thursday, November 15, 2018 at 10:00 a.m. – 10:00 p.m.
Venue presale tickets will be available online only at Ticketmaster.com with the venue presale code. The venue presale code will be released via email to all venue subscribers at approximately 10:00 a.m. on Thursday, November 15th. If you do not subscribe to The Dow Event Center email newsletter and would like to receive the venue presale code, please sign up for our emails at https://bit.ly/2LC76Y2 by Wednesday, November 14th at 11:59 p.m.
On Sale: Friday, November 16, 2018 at 10:00 a.m.
*Children under 1 year of age do not require a ticket when sitting on the lap of an adult. *8 ticket limit per purchase. *Children are not allowed access to the V.I.P. Meet & Greet without a V.I.P. Meet & Greet paid adult. *Each adult and child attending the V.I.P. Meet & Greet must have a V.I.P. Meet & Greet ticket.